Willard Hershey was head of McPherson College's chemistry department from 1918 to 1945. He and his students became maniacally interested in diamond synthesis, constructing a 4000 C electric arc furnace, enduring mercury vapourisation explosions, protracted acid bath sessions and meticulous inspection and testing. "At last, a man was found in Chicago who was confident that he could build a furnace of the required type. Special steels were generously contributed by steel companies and after a great deal of work and research, the furnace was completed—a simple affair no larger than a two-gallon pail, but capable of producing temperatures ex­ceeding 4,000 degrees, Centigrade." "Several attempts were tried to use mercury for cooling. In one case the mercury was thrown on the red hot fused liquid. There was a violent explosion. Small hot metallic shots formed and flew all over the room." "The hardened mass of carbon and iron was removed from the freezing mixture and treated with hot aqua regia for 300 hours to dissolve the iron. The residue, mostly amorphous carbon and graphite, was digested as much as possible in various acid solutions. The search for diamonds was then begun in the black carbon dust." "After the iron had solidi­fied it was dissolved in hydrochloric acid. It required over a year to complete the solution." 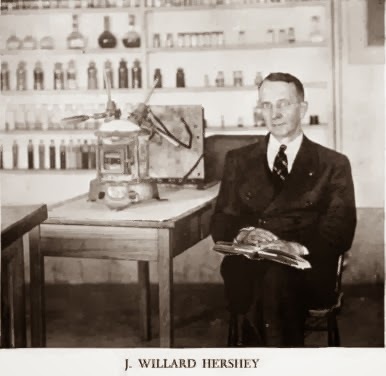 Hershey's method was to chill white hot molten iron containing dissolved carbon, as Moissan, Crookes and Parsons had done. He identified 50 diamonds in his residues, one of 1/30 carat weight. He published his book, "The Book of Diamonds" in 1940. The final chapter of this diamondiferous tome, "How to Make Synthetic Diamonds," is reproduced below. 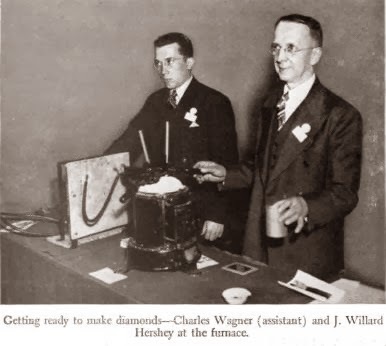 Publication went ahead even though the Gemmological Institute of America had tested five diamonds sent to them by Hershey in 1938, identifying them as natural diamonds and quartz. His decade of herculean and dangerous work was blighted by an assistant, as had Hannay's. Someone had put real diamonds into his experiments. Would you buy a second-hand car off either of the blokes next to Hershey, below? Carbon is one of the most interesting of all the ninety-two elements, because of the many forms in which the pure element is found and the infinite number of com­pounds of which it is a component part. One of the most interesting forms of carbon is the diamond, not only be­cause of its high value but also because of the amount of work which has been done to obtain it by means of syn­thesis. A great deal of work still remains to be done before synthetic diamonds can be produced on a commercial basis. Soon after Lavoisier demonstrated in his remarkable work that diamond was crystalline carbon, attempts at its artificial preparation were made. Many attempts have been made to manufacture synthetic diamonds, that is, to en­hance the commercial value of carbon by transforming it from its ordinary opaque black condition to limpid crystals of diamond. The attempts made in this direction have been numerous, but little has been done in a methodical and systematic manner. If we except some important works on the subject, we see from the historical side of the question, how much contradictory or doubtful matter has been published. However, while the number of experiments has been large, the publications have not been as extended as one would at first expect. It appears, without doubt, that many of the workers have considered more the synthetic prepara­tion of carbon for the diamond than the study of the dif­ferent allotropic forms of carbon. A tube twenty inches long by four inches in diameter was bored so as to have an internal diameter of half an inch. In the tube was placed a mixture of ninety per cent of rectified bone oil, and ten per cent of paraffin spirit, together with four grams of the metal lithium. The open end of the tube was welded air-tight, and the whole mass was heated to redness for fourteen hours; on opening it a great volume of gas rushed from the tube, and within was a hard, smooth mass adhering to the sides of the tube. It was quite black, and appeared to be composed of iron and lithium, but on closer inspection small transparent pieces were found imbedded in it. The mass was dissolved, and the small transparent pieces proved to be 'crystalline carbon', exactly like diamonds but almost micro­scopic. Sir William Crookes attributes the possibility of making artificial diamonds to the facilities afforded by the enor­mously high temperatures which have been obtainable only in recent years by the use of electricity. While elec­tricity has, no doubt, played an important part in the sci­entific researches during the last decades of the nineteenth century, Mr. Hannay's experiments would indicate that it is not absolutely essential to have extremely high tempera­tures or pressures in order to produce artificial diamonds. Still Sir William Crookes shows that by means of these high temperatures substances such as carbon obey the common laws which govern other substances, and can be made vola­tile and fusible under certain conditions. He has demon­strated that the temperature necessary to volatilize pure carbon is about 3,600° C, and that it passes into the gaseous state without liquefying. He infers that, if, how­ever, sufficient pressure were applied with the high temper­ature, liquid carbon would be produced which upon cool­ing would crystallize in diamonds. In making this product the absence of oxygen is absolutely necessary since carbon at high temperatures is chemically most energetic, and if it can possibly get at oxygen from the atmosphere or from any compound containing oxygen it will combine with it and fly off in the form of carbon dioxide. Heat and pressure, therefore, are of no value unless the carbon can be kept inert. Sir William Crookes went through the process of pro­ducing diamonds before the eyes of his audience, but was able to show them the result of his experiment only by producing a lantern slide of microscopic diamonds which he had made in the same way previously, for it takes a fort­night to separate them from the iron and other substances in which they are imbedded. The scientific principle upon which this experiment rests, according to Sir William Crookes, is that iron dissolves carbon, and it increases in volume as it passes from the liquid to the solid state. Authorities differ somewhat as to the exact moment when molten iron expands in cooling, but it is the generally accepted theory that expansion takes place at the moment of solidification. It is also a well-known fact that shrinkage or contraction takes place as the solidified metal cools. It is therefore possible to obtain enormous pressure in the molten center of a casting by the contraction of the outer shell which has been rapidly cooled and the expansion of the inner mass just as it begins to solidify. This process supplies the two factors necessary for the crystallization of the diamond—heat and pressure. 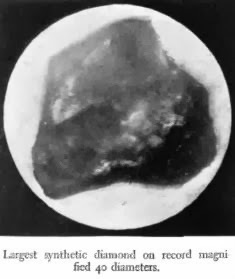 Of the early attempts to make synthetic diamonds the most successful was that of Henri Moissan, a Frenchman, who, after patient and careful experimenting succeeded in 1896 in obtaining minute particles of diamonds. He very carefully investigated the scheme that Nature employed in making her diamonds and he found that she did so by heating carbon to a very high temperature and cooling it suddenly under enormous pressure. Swedish iron was melted in the presence of sugar carbon in an electric fur­nace at a temperature which, seldom exceeded two thou­sand degrees Centigrade. When the iron was saturated with the carbon at the temperature of the electric furnace the crucible containing the fused metal was removed from the furnace and plunged into ice cold water. The pressure pro­duced by the quick chilling of the outer crust with, an in­ternal expansion changed the black sugar carbon to crys­tal diamonds. The iron of the solidified mass was dissolved in strong acids. From this residue Moissan obtained tiny crystals which had the properties of diamonds. His largest synthetic diamonds were three-fourths of a millimeter in diameter. In a paper to the Royal Society in 1888 Hon. Sir Charles Parsons described experiments in which a carbon rod heated by a current of electricity was immersed in liquids at pres­sures up to 2,200 atmospheres, and in which the liquids-benzene, paraffin, and bisulfide of carbon—were found to yield deposits of amorphous carbon. In another paper to the Royal Society in 1934 he gave the following method. A deep iron dish was packed tightly with graphite, and above the graphite was filled in loosely to a depth of half an inch covering the ingot of iron. An arc was struck by a carbon on to the ingot submerged in the loose graphite. When the iron was well boiled the ingot remained in the bed until it had quite set, hard enough to handle with the iron spoon, and then cooled in water and mercury. It gave a fair diamond residue. About one to three per cent of other elements such as manganese, cobalt, and silicon added to iron appeared to give the best results. It has been long known that iron, when melted, dissolves carbon, and on cooling, liberates it in the form of graphite. Moissan discovered that several other metals, es­pecially silver, have similar properties. The quantity of car­bon entering into solution increases with the temperature. For the manufacturing of artificial diamonds the first necessity is to select pure iron free from sulphur, silicon, phosphorus, etc., and to pack it in a carbon crucible with the pure charcoal of some organic substance such as sugar and starch. Moissan used such a mixture in a furnace with 700 amperes and 40 volts. Beside graphite and diamonds there may be formed black opaque carbon particles of a density from 3.0 to 3.5 and the hardness of diamonds. These are black diamonds or carbonado. In fact compara­tively few diamonds are transparent and colorless and show crystalline structure. Besides these may be carbide of sili­con and corundum, arising from impurities in the material employed. Graphite dissolves in hydrofluoric acid. Gra­phitic oxide may be left. 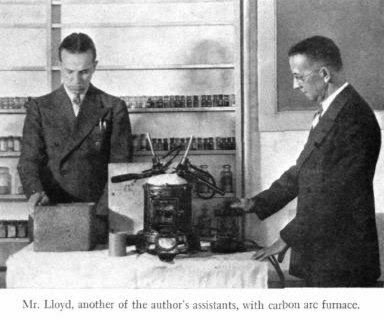 Crookes says Sir James Dewar placed a few small dia­monds in a carbon tube, and, maintaining a current of hydrogen to prevent oxidation, raised the temperature of the tube in an electric furnace to that of the arc. In a few minutes the diamond was transformed into graphite. To remove graphite after it is well washed allow it to soak in strong hydrofluoric acid in the cold for two days, then in boiling acid. After this treatment, hot sulfuric acid is again applied to remove the fluorides. The residue is well washed and again treated with nitric acid and potassium chlorate—kept warm but not above 60 ° C. to prevent ex­plosion. By repeating this process six or eight times all of the graphite will disappear. An article that appeared in Nature (London), May 19, 1928, treats the problem of the making of artificial dia­monds. The author, who is known as C. H. D., refers to the experiments and results of various experimenters, among whom are Crookes, Parsons, and others. His general conclusion, drawn from the experiments of these men, is that no artificial diamonds have been produced in the labo­ratory as yet. In the Philosophical Magazine, March, 1929, in an ar­ticle written by Sesta, the thesis that no synthetic dia­monds were ever made in the laboratory is discussed. Dr. Sesta argues that the work of Professor La Rosa has un­doubtedly escaped the attention of the above mentioned author. Dr. Sesta claims that these objections raised against the method of Moissan and his followers are groundless so far as the case has been examined. He further states that the results of the experiments and the accuracy of method are sure proofs which lead him to withdraw from the ulti­mate conclusion arrived at by C. H. D.
In 1923 an article appeared in a McPherson, Kansas, newspaper to the effect that diamonds had never been man­ufactured and, in the opinion of its writer, a noted scien­tist, never would be. We read the article with interest be­cause, secretly, for years, it had been our belief that some day science would succeed in what then seemed to the best trained minds in the field an impossible task. It was deter-mined to conduct experiments along the lines already thought out. In our opinion views of Moissan that dia­monds are made by the compression of carbon are correct, but his method of making them may be improved upon. A plan of the procedure was outlined and the assignment given to senior students working in the chemistry depart­ment. The first step in the plan was to secure an electric arc furnace capable of producing a temperature of 3,000 to 4,000 degrees Centigrade—about twice the temperature ob­tained by Moissan. It was soon learned that no such furnace could be ob­tained from laboratory equipment companies in either the United States or Europe. The use of an oxygen-hydrogen blowtorch was next suggested, and the necessary equipment was transferred to a local welding shop for an experiment. However, it was found that the oxygen from the torch burned away all the carbon from the mixture of carbon and iron before the desired temperature could be obtained. Next firebrick was secured from a steel foundry and at­tempts were made to build our own electric arc furnace. A neat furnace was constructed, but its first trial proved that its current consumption was too great for the ordinary power lines leading to the college. The equipment was transferred to the municipal lighting plant, where sufficient current could be obtained. Here the furnace was reduced to a glazed mass of molten rock by its own heat. The out­look was very discouraging. The next five years were spent in gathering equipment and information. At last, a man was found in Chicago who was confident that he could build a furnace of the required type. Special steels were generously contributed by steel companies and after a great deal of work and research, the furnace was completed—a simple affair no larger than a two-gallon pail, but capable of producing temperatures ex­ceeding 4,000 degrees, Centigrade. Crucibles and electrodes of chemically pure synthetic graphite were made by the Acheson Graphite Company at Niagara Falls for use in the furnace. It was necessary to in­stall a special transformer and a heavy power line, since the power consumption of the electric furnace was extremely high. On June 7, 1929, a mixture of two parts of chemically pure iron filings and one part of pure sugar carbon, parts taken by volume, was placed in a graphite crucible, which in turn was placed in the furnace and heated continuously for one hour and seven minutes, after which, the crucible was removed and plunged into freezing mixture. As the white hot molten iron cooled to a red solid, it ex­panded. As it cooled from a red solid to room temperature, it contracted. Thus the outside surface of the iron, which cools more rapidly than the inside of the mass, contracted while the inside still expanded. The carbon which dissolved in the iron was thus subjected to a pressure estimated at 180,000 pounds, or ninety tons, per square inch. The hardened mass of carbon and iron was removed from the freezing mixture and treated with hot aqua regia for 300 hours to dissolve the iron. The residue, mostly amorphous carbon and graphite, was digested as much as possible in various acid solutions. The search for diamonds was then begun in the black carbon dust. After two days of searching with microscopes by the as­sistants and students interested in this work we were re­warded for our labors. Two stones were found, which, after being tested were found to be pure transparent diamonds of the finest quality. These diamonds, although quite small, were the largest synthetic diamonds on record. Since that time, McPherson College chemistry students have continued the experiments using different forms of carbon, different metals and alloys as solvents for the car­bon, and different methods of procedure. Some of the solvents recently used besides pure iron, are meteorite iron, copper, silver, lead, nickel-steel, manganese-steel, tungsten, aluminum, and blue ground from the South African diamond mines. None of these proved to be so suit­able as pure iron filings. Carbon did not dissolve in copper at all, and not very readily in molten silver. Tungsten was heated in the furnace for about two hours because of its high melting point and by that time most of the carbon was burned away into carbon dioxide. The tungsten on cooling was found to be changed largely into an oxide, tinted somewhat yellow. No diamonds were formed when lead was used. The lead seemed to form carbide of lead. When aluminum was used as a solvent for carbon, some hard crystals having the appearance of diamonds were formed, but these would not withstand the tests to which they were subjected. Probably they were carbide of alu­minum or spinel. In the mines of South Africa, diamonds are found in a hard blue ground which may have had some part in form­ing diamonds in nature. With this fact in mind, some blue ground was obtained from South Africa and used in an experiment as a solvent for carbon. This blue ground worked in much the same way as iron until it was treated with acid in an attempt to dissolve it. The mass then be­came as hard as concrete and nothing more could be done with it. Recently, other substances have been substituted for sugar carbon, especially pure gum arabic—a form of starch —since this has a larger number of carbon atoms per mole­cule. Coal, wood-charcoal, coke, petroleum carbon, and other forms of carbon were used, but the most successful has been gum arabic. In most cases the atmosphere of the furnace during the heating was one atmosphere of the ordinary air. In a num­ber of cases hydrogen was used as atmosphere during the experiment. A steady flow of hydrogen was passed into the furnace before the electric current was turned on and con­tinued until the mass was completely fused. The hydrogen was generated a long distance from the furnace and dried by passing through calcium chloride before passing into the furnace. Some diamonds are formed in such an atmosphere but none larger than with ordinary atmosphere. In several experiments a small natural diamond was used with the hope that it might serve as a nucleus for a larger diamond. In only one case, however, did we obtain a small diamond. But on that occasion we had not weighed the nucleus diamond at the beginning. It could not be certain, therefore, whether the gem we took out was newly formed or the one that we had put in. More likely it was newly formed since the experiment was repeated a number of times afterwards and in none were any diamonds found. Probably the diamond that was put in at the beginning of each experiment was burned into carbon dioxide by the high temperature of the furnace. An ice-brine solution has been used in most of the exper­iments to cool the hot molten mass taken from the furnace, but various other methods of cooling have been tried. In several experiments, all of which failed, the fused mass was allowed to cool slowly to room temperature. It appears that rapid cooling is necessary in order to form diamonds. In an attempt to secure more rapid cooling, liquid nitrogen and solid carbon dioxide were used. Neither was satisfactory. The instant hot molten iron was dropped into liquid nitro­gen, the nitrogen changed to a gas, immediately forming an insulating atmosphere around the iron which prevented rapid cooling. When solid carbon dioxide was used, it was impossible to secure a surface contact which would cool the iron effectively. When the white hot fused mass is thrown into the cold water (ice brine solution), some of the water burns and sometimes explodes since part of the water decomposes into hydrogen and oxygen. The stone jars that were first used for holding the cold water were usually broken when the hot fused mass was thrown into them. Recently large graphite crucibles have been used. Several attempts were tried to use mercury for cooling. In one case the mercury was thrown on the red hot fused liquid. There was a violent explosion. Small hot metallic shots formed and flew all over the room. In another in­stance the fused mass was poured on top of the mercury. In this case very little explosion occurred. Diamonds were not formed in either case. Many other methods of cooling have been tried, but none has been as effective as the ice-brine solution. It appears that it is not the extremely low temperature of the cooling agent, but the rate of change of the temperature of the molten iron that determines the pressure and the inner contraction of the iron and carbon mixture and forms diamonds. In all of the above experiments alternating current was used. The heating was conducted as follows:— A mixture of chemically pure iron filings and starch carbon was heated in the furnace for one hour and fifteen minutes. The current used was 70 volts and 150 amperes. On April 21, 1937, a direct current was supplied from the electric welder at the Churchill Boiler Works of Mc-Pherson. It was used in an experiment made in June, 1937. The procedure for this experiment was much like that for the one above excepting that in this case 100 volts and 250 amperes were used. An arc was struck between a carbon electrode in the welding holder and the surface of the mix­ture in the crucible. In the first case no diamonds were apparently made and in the second case very small crystals scarcely large enough to be seen were formed. There is some doubt as to whether these were diamonds. In the years since the first diamonds were made under the author's direction, a great deal has been accomplished. The procedure has been greatly improved and shortened. At present the iron from the furnace after being cooled is dissolved in hot aqua regia. The residue is digested first in hot concentrated sulfuric acid and dissolved potassium ni­trate. The remaining residue is washed with water for sev­eral days and then searched for diamonds. Recently a student (Jonathan Hamersley) proposed a new plan which may save a great deal of work. He sug­gested that after the residue is washed with water it be fused with potassium bisulfate, which has a specific gravity between that of graphite and diamonds. This would allow the diamonds and a few particles of carbon to sink to the bottom, while the graphite would float on top. After the mass would harden, the diamonds, if any, could be re­moved from the bottom of the solidified mass. "When the hot, melted metals containing carbon are poured into the cooling bath, there is some tendency for the metal to form globules the size of a pea to much smaller globules. However, the sputter of the water is in­sufficient to make all the metal into globules the size of a pea. About three-fourths of the metal is in globules or chunks the size of a half dollar. If it is assumed that dia­monds are most likely formed in globules the size of a pea, then these half dollar pieces are a great waste. A method devised by the above mentioned student makes use of a sieve to produce globules of the desired size. The name given to this method is the "Drop Shot". The first piece of equipment necessary is a sieve that will stand molten metal. Fifteen holes were drilled in the bottom of a graphite crucible, exactly like the one used in the furnace. Against the bottom is directed the hottest possible flame of a compressed air-natural gas blast lamp. This is to pre­vent too rapid cooling of the fused metal which will not solidify in the sieve before running through and producing drop shot. Fifty-seven pounds of iron were melted by the Hutchin­son Foundry and at the same time it was poured, a pint of sugar carbon was mixed with the melted iron to see whether any of the sugar carbon would crystallize into diamonds. The purpose of trying this method instead of the usual one was to see whether we might get larger stones by using larger quantities of iron. After the iron had solidi­fied it was dissolved in hydrochloric acid. It required over a year to complete the solution. The residue was then washed and searched for diamonds. Several dozen trans­parent crystals the size of an average pin head were found. Treating these with pure hydrofluoric acid failed to dissolve them in twenty-four hours, but after thirty-six hours they began to become somewhat soft. This proved that they could not be diamonds. They could not be the ordinary quartz since they remained in hydrofluoric acid for over a day without dissolving. They are probably minerals as spinels or corundum. The identification tests used on the diamonds are the following: insolubility in hydrofluoric acid, hardness, spe­cific gravity, index of refraction, and burning in an at­mosphere of oxygen. The power of a transparent medium to refract a ray of light is expressed by a certain number called index of refraction. The phenomenon of dispersion shows that this number is different for rays of colors, or wave lengths. It is generally greater in proportion to the density of the medium. A diamond is insoluble in hydrofluoric acid, although this dissolves most other substances. The hardness of a diamond is tested by scratching on carborundum. The spe­cific gravity of the diamond is usually tested in methylene iodide which has a specific gravity of 3.33 at 150 C. and very close to that of the diamond which is 3.51. Diamonds burn in oxygen at 800 degrees, Centigrade. 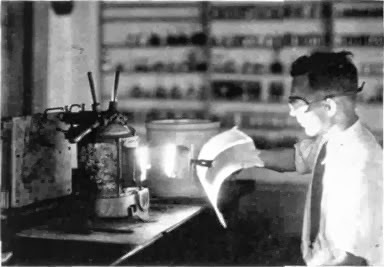 In the burning test, the specimen is placed in a platinum boat, which in turn is placed inside a silicon tube and heated to 800 degrees, Centigrade, while oxygen is passed into one end of the tube and out of the other and through a Geissler tube containing potassium hydroxide. If the specimen is a diamond it will burn, forming carbon dioxide which is absorbed in the Geissler tube. A pure diamond leaves no ash in the platinum boat, hence any ash remain­ing in the boat is positive proof of impurities in the dia­mond. These impurities are generally metallic oxides. They can also be detected by the color of the diamond—a pure diamond is transparent, while impure diamonds are tinted various colors. A number of the smaller synthetic diamonds have been burned and most of them left no trace of ash. A number of natural diamonds have also been burned for comparison. Since we first began our experiments in their manufac­ture more than 50 diamonds have been made synthetically at McPherson College, ranging in size from the smallest, one millimeter (about 1/25 inch) in diameter, to the larg­est, which, is two millimeters by one and one half milli­meters by one millimeter, weighing 1/30 carat. This is still the largest synthetic diamond on record. Six smaller diamonds were made in the same experiment, in which gum arabic carbon was added to molten iron and the mass cooled in an ice-brine solution. Thus the story of the diamond will always remain the romance of science—the romance of adventure—the ro­mance of the ages. While it is true that the diamond is everlastingly King of Gems, and that time cannot mar the magnificence of Nature's handiwork, it, too, is beginning to feel the effects of this highly synthetic age. In the words of Ted Brooks of the Wichita Beacon, "Coronado, daunt­less Spanish explorer, who blazed through Kansas in search of Indian gold, was four hundred years too early. A mod­ern Coronado now displaces him, not with the sword but with science as the ally, and the object of his search is not gold, but diamonds." Following the procedure for diamond synthesis, reported by J. Willard Hershey in 1929, verification of his methods were attempted in this research. A sample of soot in molten iron was generated and analyzed using Raman and Infrared spectroscopy. The soot was generated using an electric arc with carbon electrodes at 150 Amperes with a DC± current for 50 minutes. The iron mixture was cooled in an ice bath followed by HCl rinsing to free the iron from the mixture. Purification of the soot was done by liquid phase oxidation, air oxidation, and Soxhlet extraction. These purified and raw samples of the soot were tested and analyzed using Raman and Infrared spectroscopy. These methods of haracterization showed no presence of diamond. However, the Infrared spectra showed a new product at 1090cm-1, possibly representing carbon rings and ribbons. Soxhlet extraction showed an orange color, characteristic to fullerenes in solution. While this experiment showed no production of diamond, methods of characterization were established for future experiments. The methods of Dr. J. Willard Hershey and French Chemist Henri Moissan are tested. Carbon is suspended in molten iron and cooled rapidly in an ice bath to produce temperatures and pressures suitable for diamond synthesis according to Hershey’s research. A carbon arc furnace was constructed from refractory cement incased in steel pipe. The furnace is powered by an arc welder with settings of 135amps and AC current. This is run for one and one half to two hours to produce the heat required for melting the iron sample. After rapid cooling, the iron is removed with HCl. The search for diamond in the generated soot resulted in no visible examples. 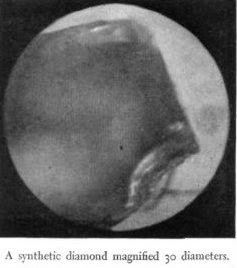 Raman spectroscopy was used to analyze the soot. This research has ended with no formation of diamond, but has provided techniques that will be beneficial for future research. Raman Spectroscopy: Raman Spectroscopy was used to characterize the soot samples. Samples from each of the trials were tested and peaks were compared with that of known samples of diamond (1333cm-1), graphite (1580cm-1), and fullerenes (1470cm-1). Toluene Extraction: Hot toluene was used to extract the soot samples to determine a presence of fullerenes. UV-Vis was then used to analysis these extractions. A know sample containing fullerenes provided peaks at 407nm, 472nm, 548nm, and 595nm, which samples were them compared. Ilopango eruption, which occurred from December 31, 1879, up to March 26, 1880. A previous eruption could have caused the extreme weather events of 535–536 AD in Europe. WARNING - Many subjects outlined within this site are extremely dangerous and are provided here for information only. Please don`t experiment with high voltages or chemicals unless you are fully conversant with safe laboratory practices. No liability will be accepted for death, injury or damage arising from experimentation using any information or materials supplied.